Final dispositor is a term that is used in modern astrology to refer to a planet in a chart which all other planets are dependent on, either directly or indirectly, through the process of rulership. The final dispositor is the only planet in the chart that is its own sign of the zodiac. The term is connected to the concept of rulership or dispositorship, where each sign of the zodiac is said to be ruled or disposited by a specific planet. When a planet is not in its own sign, it becomes ruled or disposited by the planet that rules that sign. 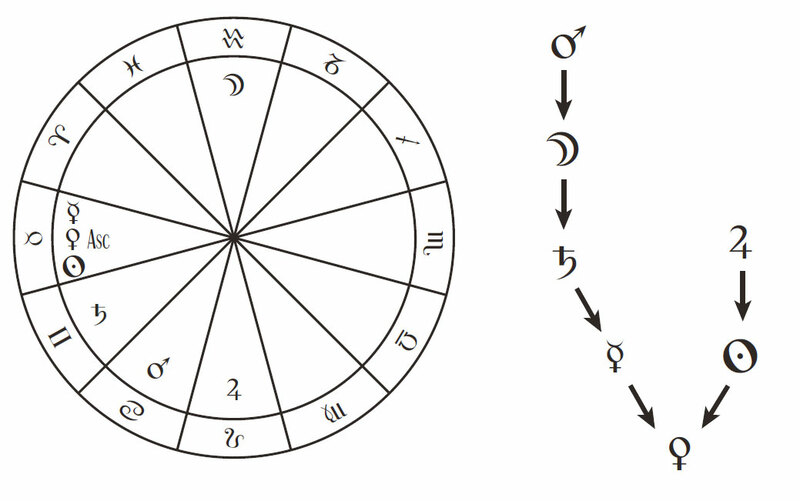 Modern astrologers create what is known as a dispositor tree, which is a diagram that lists which planets are under the control of which planets in the chart through rulership. In some charts the dispositor tree will eventually stop at a single planet, if there is a planet in the chart that is in its own sign, because a planet in its own sign is not ruled or disposited by any other planet. Thus, this planet becomes the final dispositor. The final dispositor is viewed as an important planet in the chart because it is the only planet that is in its own sign, which is seen as auspicious, but also because it is the only planet that has complete autonomy, being ruled by no other planet. To the extent that other planets are in signs ruled by the final dispositor, or in signs that are ruled by planets which are themselves ruled by the final dispositor, all planets in the chart are viewed as ultimately being under the sway of the final dispositor. If there is more than one planet in its own sign in a chart, then there is no final dispositor. Additionally, in charts where there are no planets in their own signs there can be no final dispositor. The final dispositor is essentially the modern equivalent of the traditional concept of the ruler of the nativity, although the ruler of the nativity was usually calculated differently in ancient times. Below is an example of a final dispositor tree, using the birth chart of the filmmaker George Lucas. 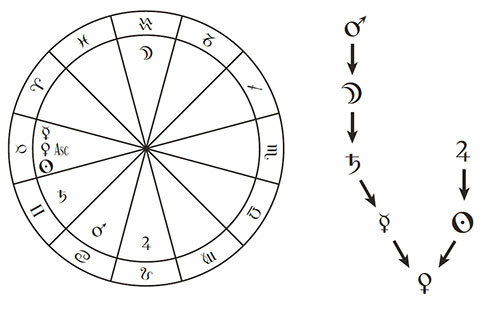 For the sake of this example we will only use the seven classical planets, and traditional sign rulerships. Lucas’ chart is to the left, and the dispositor tree is on the right. In his chart Mars is in Cancer, which is ruled by the Moon. The Moon is in Aquarius, which is ruled by Saturn. Saturn is in Gemini, which is ruled by Mercury. Mercury is in Taurus, which is ruled by Venus. Venus is in her own sign. On the other side of the tree, Jupiter is in Leo, which is ruled by the Sun. The Sun is in Taurus, which is ruled by Venus. Venus is in her own sign. The rulership or dispositorship tree ends with Venus in all cases, as Venus is the only planet in the chart that is in her own sign. Thus, Venus is the final dispositor in this example. Alan Oken, Rulers of the Horoscope, Crossing Press, Freedom, CA, 2000.